Chattisgarh is one of the major ecotourism destinations in India, with a variety of waterfalls, hills, valleys and rich landscapes nuzzled into its nooks and crannies. 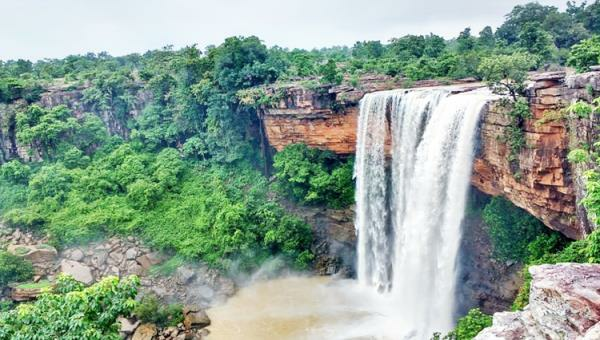 And as far as waterfalls go, Chitrakoot is a naturally occurring waterfall in the Bastar district of Chhattisgarh. It is located in the western region of Jagdalpur and is one of the prime tourist attractions in and around Jagdalpur famous for its breathtaking sunsets and just the sheer enormity of the falls that will leave you spellbound as soon as you set your sights on it. The waterfall is sourced from the Indravati river which flows westwards towards Jagdalpur and cascades down from a descent of 30m from the top of the cliff in 3 streams during summers, but the falls stretch over the whole width of 300 meters and plunge down as a magnanimous blanket of glorious roaring water during monsoon months when the river Indravati is at its maximum flow capacity. When you see the sheer force with which the water descends from the cliff and strikes the underlying surface engulfing everything that sets path in its course in a white mist, you will see that it has rightly been nicknamed the Niagara Falls of India, it is also around one-third the width of Niagara Falls. All in all Chitrakoot is perfect for day picnics, stunning panoramic views or just some time away from the commotion of the cities for detoxing amidst nature. A recent discovery tucked away in a sequestered spot away from the swarming city and surrounded by lush green pastures on both sides. Tamra Ghoomar is a natural waterfall with a height of more than 100 feet and is generally formed during the monsoon showers. It is a 20 minute drive away from Chitrakoot falls and a perfect spot for a day picnic frequented by tourists and locals alike. Immerse yourself in the tranquil quietude that Tamra Ghoomar offers and spend a day amidst dense valleys and magnificent hills. This is another natural waterfall that forms during the monsoon months, around 11 kilometers away from Chitrakoot falls. Mendri Ghoomar is nuzzled between Chitrakoot Barasur and Tirtha and located in Jagdalpur. The height of descent of the falls is approximately 70 meters with lush green covers enveloping the waterfall. The waterfall overflows during rains and has a more relaxed flow during the summers. The park has drawn its name from the Kanger river flowing along the area of the national park, The Kanger Valley National Park has a diverse range of flora and fauna and a considerable population of tribals. One of the densest national parks within India, it is located in the 34 kilometer long stretch of Kanger Valley. The national park amasses an area over 200 square kilometers of predominantly hilly topography and has lush green landscapes, caverns and serene waterfalls throughout the park. The park has a jeep safari that takes you to the Kanger Dhara Waterfall, Deer Park and the Kotumsar Caves, all within the National Park. Some of the key species found within the Kanger Valley National Park are Tigers, Leopards, Barking Deer, Pythons, Crocodiles among many others. Kutumsar Cave is a naturally formed cavern which derives its name from Kutumsar village, the area where the caves are located. Kotumsar is a limestone cave along the Kanger limestone belt in the Bastar district of Chhattisgarh, an hour's drive away from Chitrakoot falls. The caves are 200 meters long with various downwards and sideway alleys along its length. The entrance of the caves are formed by a vertical depression on the surface of the hills forming the caves, the entrance is connected to the exit by a concrete walkway created for tourists visiting the caves. The caves may flood during monsoons and is kept closed for the public during this time but remains open rest of the year. Tirathgarh Waterfalls are located in the south-west of Jagdalpur, approximately 60 kilometers from the Chitrakoot falls. The water descends from a height of 91 meters in a criss cross pattern. It adjoins the Kanger Valley National Park and is very close to Kutumsar Caves. A small waterfall in the Potanagar area on the road leading up to Chitrakoot falls approximately 25 kilometers away from Chitrakoot Waterfall. The waterfall has stretches of green cover and small ponds all over the area. Chitradhara is a lesser known place and hence receives lower volumes of tourists in comparison to Chitrakoot waterfall. A fourteenth century temple in Dantewada around 30 kilometres from Chitrakoot falls is devoted to goddess Danteshwari, the Kuldevi of the Bastar region. The temple is believed to be one amongst 52 Shakti Peethas(shrines of Shaki). Local legend suggests that the temple was erected where the tooth of Sati fell during the creation of Shakti shrines. The locals celebrate Dussehra with a huge procession for the goddess transversing the whole town. The former headquarters of Bastar Kingdom, Bastar Palace was built by the rulers of Bastar. At present the palace's regular upkeep and maintenance is foreseen by the government. One of the major tourist attractions in the Bastar area, the palace is encircled by gardens on all sides and famous for its artifacts and historical relics that adorn the palace walls. The Bastar Palace is about 40 kilometers away from Chitrakoot falls and should be about an hour from there. 1. The Chitrakoot falls are magnificent in itself and you could spend your time just taking in the amazing view but there's also a couple more interesting activities that you could partake in. 2. Do not miss the boat rides in the pool formed at the bottom of the waterfalls, the boat ride offers you stunning views of the waterfall and the boatmen can also take you up to the sprays and let you experience the gushing mist that emerges from the waterfalls. You have climb down a flight of stairs to take the boat ride, and even if you decide to not take a boat ride the view from the bottom of the stairway is the best and provides for a great photo op so definitely make your way down and you might also chance upon a rainbow on some rainy days. Chitrakoot Waterfalls is the perfect monsoon getaway with overflowing pools and a majestic cascade of water from the cliffs. It is quite a tourist hotspot and is thronged by visitors throughout the year. It is also the perfect backdrop for every photography enthusiast with its alluring views. Whether it is a day picnic with your family or if you just want to spend some time by yourself in the company of nature and enjoy the serene surroundings contemplating life Chitrakoot is perfect for you. The best time to visit the Chitrakoot falls is during the monsoon months from July to October, the flow from the Indravati river is at its peak and the waterfall is in its full glory.The winters are also a great time to visit, the climate is very pleasant and the water is milky white. 1. The summers are very hot here due to lack of any green cover, so try and avoid planning a visit during summers. 2. If you plan on staying at the accommodations or the government cottages nearby, book your rooms well in advance so that you can secure a room with a direct view of the falls. 3. If you are using state transport to get there, arrive early and try winding up your visit around 4.30 pm because the last bus leaves for Jagdalpur around 5 pm. The nearest airport is the Raipur airport around 285 kilometers from the water falls and the closest station is the Jagdalpur railway station, you can get a shared taxi or a private taxi from the station up to the falls. The cheapest way to get to the falls are the state run buses that ply from Jagdalpur to Chitrakoot falls, there are around 4-5 buses running everyday and take upto 2 hours to cover a distance of 38 kilometers.